CANNA COCO is made up of thousands of capillary micro-sponges that retain almost 1000% of their own weight in water. Therefore COCO retains an enormous buffer of water and nutrients. 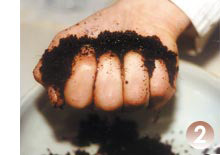 It is recommended that the grower keeps the media a bit dry rather than soaking wet. Wet circumstances form an ideal basis for fungal diseases like Pythium. 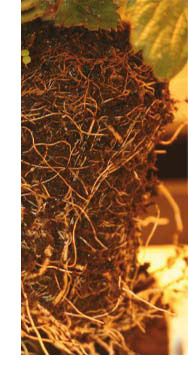 A drier substrate passes more air through to the roots stimulating them to absorb water and nutrients more actively. This results in a faster growth and higher yields. A 1:1.5 analysis can best be done after 3 to 4 weeks. The target values for EC are between 1.1 and 1.3, for the pH, between 5.5 and 6.2. Very high EC values increase the risk of burning symptoms. To limit the risk of burning symptoms, the COCO can be rinsed with acidified water containing Coco A/B nutrient at an EC of 0.65 (pH 5.8). 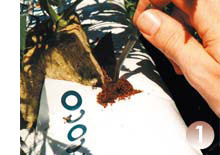 Damage to crop caused by hard water Normally, PK13/14 and CANNA COCO nutrients can be used together. However, in case the tap water is very hard, this combination can cause problems. 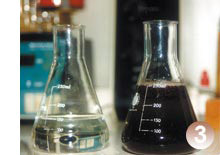 Very hard water contains high amounts of calcium and the amount of acid necessary to set the pH is relatively high. This is due to a high bicarbonate level in the water. When PK 13/14 is used under such circumstances the risk of precipitation in the water tank increases, and this can cause blocked drippers. If you use very hard water for irrigation it is recommended to use pH – grow (nitric acid) instead of pH – Bloom (Phosphoric acid) to set the pH.